Over the years company intranets have become an indispensable part of any digital workplace. When deployed successfully, intranets can improve communication, enhance collaboration, and encourage productivity throughout the workplace. But transitioning to a new work platform can feel a little intimidating. MangoApps’ simple, step-by-step, getting started process always keeps new users in mind and makes getting started easy. The MangoApps onboarding process begins long before you officially launch your social intranet. The structure and user interface of each MangoApps domain is custom designed well in advance according to each business’ individual needs and culture. Before inviting any employees to your new social intranet platform, meticulous planning is done with MangoApps representatives to evaluate your specific business objectives and ensure that your domain is well prepared to achieve the right results. But regardless of your individual layouts, objectives, and designs, each getting start experience is simple and exciting. As a domain administrator, you have the ability to add, remove, and edit all of your different users. MangoApps makes it easy to invite and add new users at any time. From the domain portal, just access the People module and choose ‘Invite’. 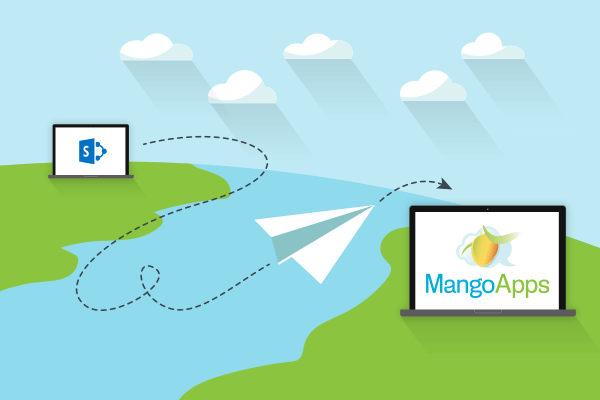 You can now invite any number of employees to become MangoApps network users. You’ll just need to specify their email ID and add their first and last name to the text boxes. You can even include an optional invitation message for the new user. Administrators can also incorporate a large number of new users into MangoApsp using CSV files or other company resources. You can even invite guest users into the domain. Guest users can be contractors, freelancers, clients, or anyone else who works closely with your organization and would benefit from regular communication. By streamlining the user incorporation process, employees and other guest users can log in and start using MangoApps right away. When a new user logs into MangoApps for the first time, they are presented with a set of steps to walk them through getting started. As a domain admin, you can customize this getting started experience for your unique domain users. From the admin portal, it’s simple to enable, configure, or re-order the getting started steps however you need. Administrators can choose from the following getting started experiences. Introduction Video – This option allows you to incorporate an introductory video into the MangoApps experience. Your video can either be an out-of-the-box option MangoApps provides or your own custom introduction. An introduction video helps employees understand what MangoApps is, why they will be using it, and establish some general expectations. It can also play an important role in emphasizing and educating users about various MangoApsp features. Change Password: The change password feature allows employees to create a new and unique password for their personal login. Administrators can also enable specific password parameters like password strength and character limits. Profile Overview: The profile overview option takes users to their individual profile page where they can begin adding profile details such as a profile photo, name, employee ID, and more. Enabling this feature as part of the getting started experience helps users create a detailed and accurate personal profile right from the start. Profile About Me: Like the profile overview, the profile about me section, directs users to their individual ‘about me’ area. This section allows users to update specific and personalized details like alias name, skills, and expertise. Locale: With MangoApps, users can configure their local settings like date format, time format, time zone, and language. This is a great tool for remote employees who are spread out across multiple time zones and lets each employee work with the format and setting where they feel most comfortable. Team Recommendations: When employees log in to MangoApps for the first time, they might not know what teams to join or how to find the groups they want to connect with. By enabling the team recommendations area, employees can find the groups, projects, and departments they need to quickly transition into the domain. Team recommendations also help them become part of a specialized community right from the beginning. Notifications: MangoApps was designed to make your workforce much more productive. One of the ways we accomplish this goal is by providing users with the opportunity to customize their own notification settings. Customized notification settings enable employees to receive all of the updates they need, while still enjoying a noise free environment to work. Invite: When the invite option is enabled, employees can invite their colleagues to the company portal. Custom Steps: MangoApps also allows domain admins to add their own individual steps, so companies can include everything they need for a successful getting started experience. A custom getting started section can consist of video content, rich text content, or profile information. On their very first day within the MangoApps environment, your employees can go through a series of training and introduction session specifically designed by you. MangoApps allows domain admins to easily plan and design their own training and introductory courses or use our detailed out of the box materials. Admins can easily edit and add videos, documents, links, and additional information to ensure that your employees have everything they need. Depending on the scale of your project and the number of users you’ll be onboarding, you may want to consider a staggered or ‘soft’ roll-out approach to road-test your new intranet. A soft rollout involves selecting a smaller group of employees to test the experience before generally granting access to all employees. Approaching onboarding this way can be a particularly useful tool, especially if you have a large company or a workforce unfamiliar with collaboration technology. Soft rollouts allow management to gather feedback, support, and insight in a more manageable environment, helping you create the most effective company-wide onboarding experience. MangoApps helps keep company-wide rollouts easy. All of our portals are easy to use, set up, and get started. And of course, we’re here to support you every step of the way! When you do it right, a successful rollout engages employees, creates excitement, and makes the transition to MangoApps easy. To learn more about how MangoApps helps companies get started or to receive a personalized ManogApps tour, contact us today.